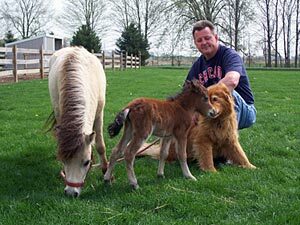 Knapp’s Knee-High Miniature Horse Farm is located in beautiful LaPorte County in northwest Indiana near Lake Michigan. We began this adventure very humbly in the fall of 2003 with the purchase of a mare that was supposed to be in foal (she wasn’t) and a weanling filly. The following spring we purchased a very pregnant mare — I was determined to have a foal that spring! We have grown to 20 mares and 2 stallions. Although I would love to have more horses, I feel that this is a good number for us because 1) I don’t want to crowd my horses, and 2) I want to be able to spend time with each of my horses almost every day. I work at a veterinary clinic about 25 hours per week, so between my job and the horses I keep very busy! 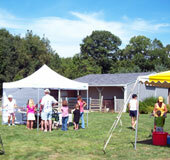 Thank you to everyone who attended our previous eight "Open Barns." They were a fun opportunity for us to see old friends and make new friends; however, due to declining attendance, we have decided not to host an open barn in 2015. We may go to hosting every other year, depending on requests. In the meantime, we love to have visitors, by appointment. Please call or e-mail to schedule a visit!